How To Make OLA Rides Safer By Adding Emergency Contacts Details:- When you live in cities, you no longer rely on local autorikshaws as they could charge you way more than the normal fares. You wouldn’t even want to take an autorikshaw when you have apps like Uber and OLA all braced up to pick you up from wherever you are and to drop you off at wherever you say at very reasonable fares. With the pros, comes the cons. When you travel alone, your safety could be in danger with a rough driver. OLA has come up with an efficient solution for this problem. You can add emergency contacts details to the application to which your ride details could be sent every time you take one. This new feature has a lot obvious benefits. 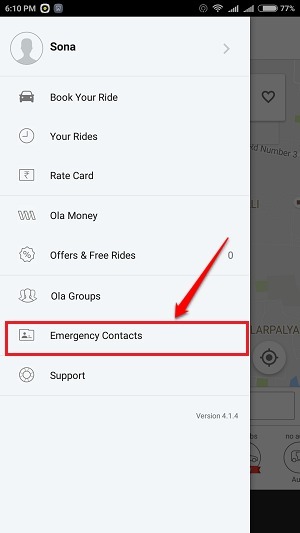 Read on, to learn how to efficiently use the OLA emergency contact feature. 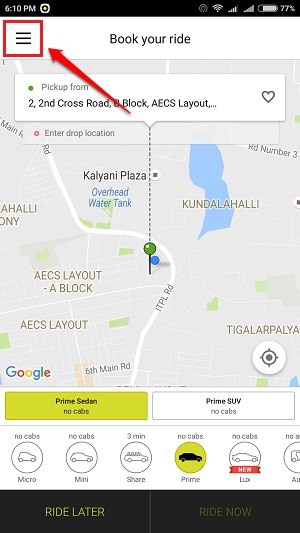 Launch the OLA app by clicking on its icon. When the app opens up, click on the More Actions icon at the top left corner of the app screen. 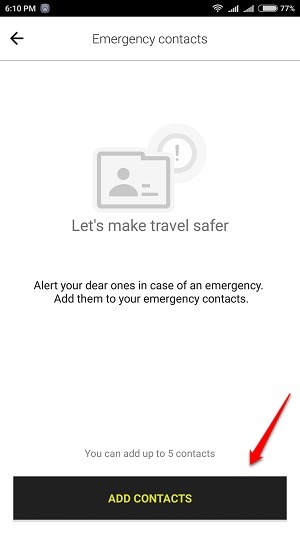 As next, click on the Emergency Contacts option as shown in the screenshot given below. Deep down at the screen, you will be able to see the Add Contacts button. Click on it and then you will be taken to the Contacts app to add the emergency contacts. You can add upto 5 emergency contacts. I have added one contact as an example in the following screenshot. 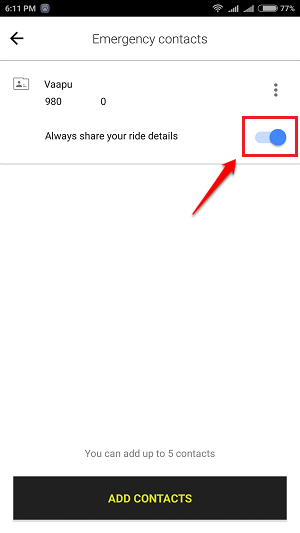 While you are on a ride in OLA, you can send your ride details to the contacts you specify by clicking on a button. 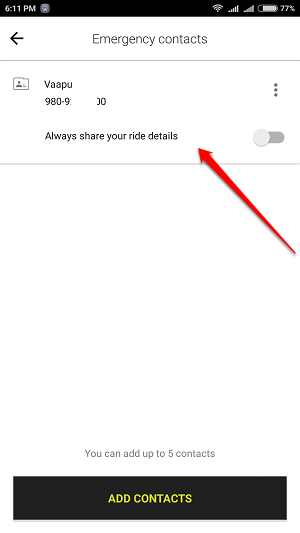 If you turn on the toggle button corresponding to the option Always share your ride details for an emergency contact, then whenever you are on an OLA ride, your ride details will be shared with the specified contact. Standard SMS rates may apply for this feature. Now if you want to delete a contact from the Emergency Contacts list, you can click on the 3 dots icon associated with the contact and then click on the Delete option as shown in the following screenshot. Start feeling safe during your OLA rides from now on. Hope you found the article useful. If you have any doubts regarding any of the steps, please feel free to leave comments, we would be happy to help. Stay tuned for more useful tricks, tips, and hacks. Dont be so kiddish!everyone knows this..